Barring some sort of calamitous event in the next few days, the Federal Reserve is going to raise interest rates next week. And despite what you hear, that shouldn't be the end of the bull market. Or the world. The possibility of a rate hike has unnerved the market this year. Some experts think the Fed should have ripped off the monetary policy Band-Aid in September instead of delaying the inevitable due to worries about China. You can't leave rates at zero forever. Others argue that it's still too soon for the Fed to be considering a rate hike. Markets around the world are still jittery. And there are question marks about the health of almost every major economy. So it's easy to understand why the market has been this nervous. A lot of smart people disagree about what Fed chief Janet Yellen should do. Then there's the fact that it has been so freaking long since the Fed last raised rates. More than nine years ago. June 29, 2006. And it was the end of a series of 17 quarter-point increases in a row that started on June 30, 2004. This means there are many Fed rate hike virgins on Wall Street. Think about it. A 28-year old trader was barely old enough to drive the last time the Fed began a tightening cycle. The Fed has never waited this long to raise rates in the past 30 years. The last rate hike prior to the one in 2004 was just four years before that: May 2000. Now here's the good news for those who didn't "live" through the last tightening cycle -- or who've forgotten it. Stocks didn't experience a Mad Max-esque apocalyptic crash. Just look at the chart below. 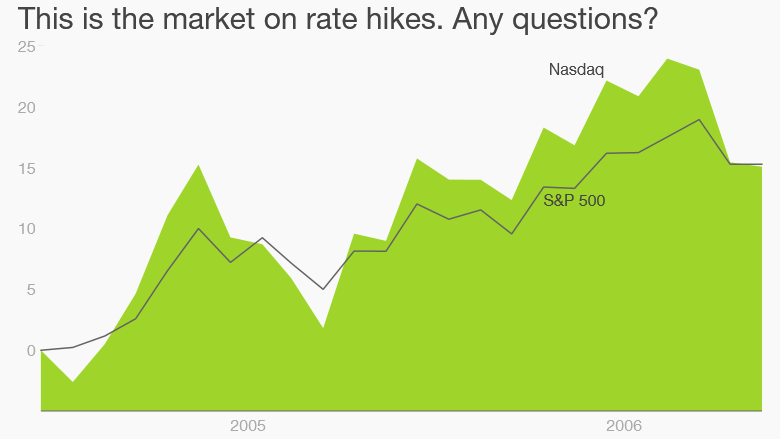 The S&P 500 and Nasdaq were both up about 15% in the two years that the Fed was raising rates. Was that a great return? No. And it was choppy. Volatile. Lots of big moves in both directions. Sound familiar? Still, it was a return. Stocks didn't go down. That wasn't the only time the market didn't sweat the Fed. Rates went from 6.5% to 9.75% between March 1988 and February 1989. 9.75%! The S&P 500 rose 11% while that was going on. Of course, this doesn't guarantee that history will repeat itself and that stocks will continue to climb once the Fed finally starts raising rates again. This rate tightening cycle is somewhat unique too since the Fed is likely to be one of the only major central banks boosting rates while the rest of the world is lowering them. So that could wreak havoc on the currency and commodity markets. We've already seen a big rally in the dollar this year as well as a massive plunge in the prices of oil, copper and aluminum. But consider this. The market held up reasonably well in the last tightening cycle even though the Fed jacked up rates from 1% to 5.25% during that span. Nobody -- including Fed members -- expect rates to go up by that much that quickly. According to the most recent of the Fed's so-called dot plots, which provide rate projections from all of the Fed's members, the median forecast is for rates to be at 1.675% at the end of next year and 2.875% once 2017 is said and done. The Fed will update its dot plot next week when it announces its rate decision. Keep in mind that these are just projections. And they include estimates from Fed members who won't have a vote next year or 2017 about what to do with rates. At the end of the day, rates will probably go up only as much as Fed chief Janet Yellen wants them to. 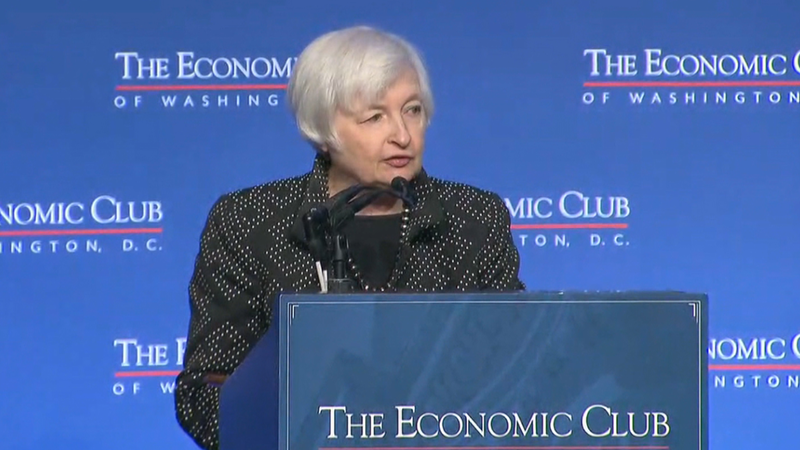 And she has strongly suggested that the Fed is not going to raise rates at every meeting next year. It will all depend on the data. But even if rates did go from zero to 2.875% in two years, so what? Anything below 3% would still not be all that high historically. They shouldn't cause demand for loans to dry up and consumer spending to crumble. Or the market to tank either. What stocks do next year (and after that) depends a lot more on corporate earnings than interest rates.